Once I got home I knew it was time to start getting dinner ready. One of the drawbacks of these group runs is getting home around 7:30pm and eating dinner much later than I'm used to. By the time I was done getting everything ready to eat it was close to 8:30pm. I had leftover ground turkey from the night before so I just needed to make some sides. After stocking up on food at Trader Joe's yesterday I finally had some vegetables to incorporate into my meal. 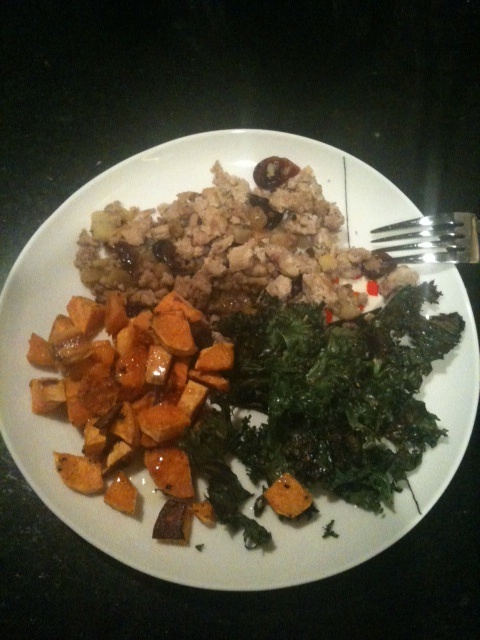 I roasted some kale and one sweet potato that I had peeled and cubed in the oven at 325 degrees for about 20 minutes. Both were drizzled in olive oil and seasoned with some salt and pepper. Once I removed the sweet potatoes from the oven (they cooked a little longer than the kale and were in the oven for about 30 minutes) I drizzled a tiny bit of maple agave syrup on them. Oh. My. God. Such an easy meal but so many delicious flavors.